This time of year is a time of transition. School is back in session, seasons and weather begins changing, sickness starts to linger, sports teams start back up and more. We all have many things in our lives that bring transition to this time of year. It can be stressful for some yet exciting for others. For me, I feel a bit of both. With two kids in school, homework, conferences and side activities started definitely adding to the stress. However, a change in season and my kids focusing more on there education provides me with excitement. I love the fall season and looking forward to the holidays. Tea and the act of drinking tea has brought much peace to my life as it can to yours as well. It has a calming effect that overcomes our bodies when we take that first sip. 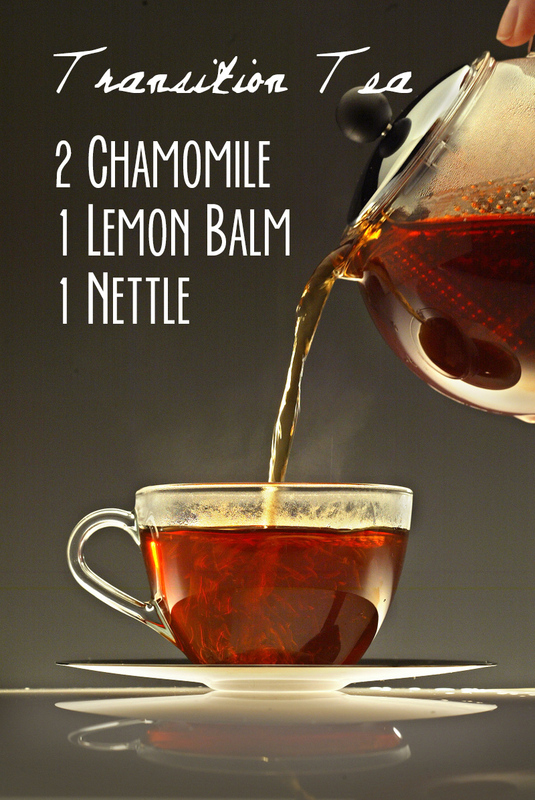 I wanted to share this wonderful soothing tea recipe I created. It is simple and effective in helping through this transition period. It’s the perfect end to our busy days. Enjoy! Mix all three herbs together and store in a glass jar. To brew, place one tablespoon of the tea in a tea ball or other strainer, and pour hot water over it. Add a bit of honey if desired, and take comfort in an evening ritual of soothing tea.